I wish I had enough words to thank you for your comments, e-mails, laughs and moved tears on my last post. I knew I would have found support and friendship in you, but – believe me – I was not expecting such a cheerful feedback! The crisis and the redemption desire sadly are common issues in these days, but on the other hand everyone of us, even if you do not want to admit it, somehow believe that dreams come true. Last time I mentioned the thought about the crisis of one of the greatest geniuses of the last century, Albert Einstein, but today I want to use the melodious words of a romantic heroine of my childhood, Cinderella. She sings: A dream is a wish your heart makes, When you’re fast asleep (…) Whatever you wish for, you keep Have faith in your dreams and someday Your rainbow will come smiling thru No matter how your heart is grieving If you keep on believing the dream that you wish will come true. Since we are down-to-earth women here, we know that the situations are to be created and the fate sometimes needs a little help. My humanities studies at high school influenced me to believe that the best way is to study, so I made a bibliography of books on Tuscan cuisine and gastronomic culture, which will become the basis of my days. One of these books is Cucina Povera – Tuscan peasant cooking, by Pamela Sheldon Johns, who teaches cooking classes and workshops throughout Italy and is the author of sixteen books, many of which are dedicated to the Italian cuisine. But these few words are reductive to describe her, one of the most important connoisseurs and ambassadors of the Italian gastronomic culture abroad. The book is engaging right from the cover and the kind of paper and binding used, since it recalls old time books. 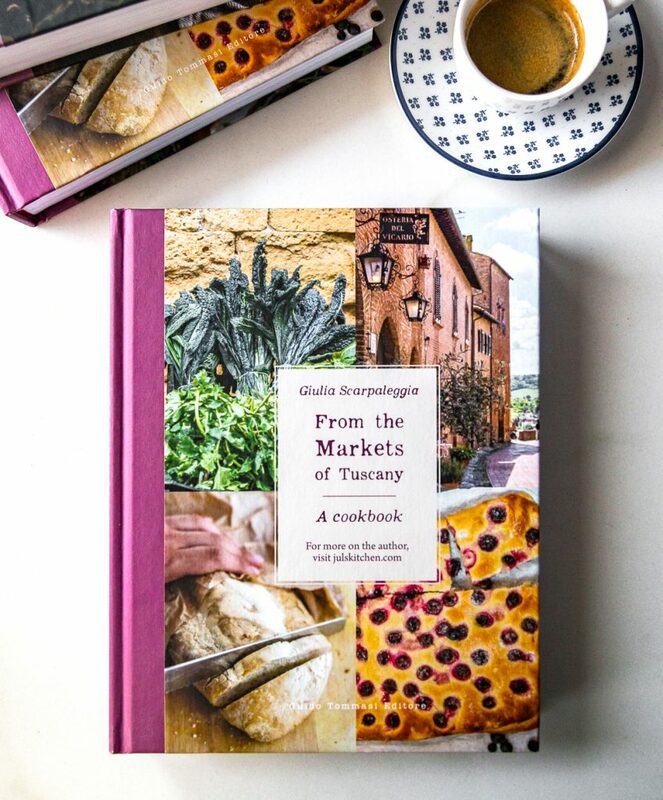 As from the title, it is about cucina povera, peasant cooking, the art to do with what you’ve got, the cooking of the times when you do not throw anything away, but you were able to cook with just a few ingredients hearty and tasty dishes to support the farmers working in the fields. The recipes belong to the times when the local produce was not a fashion issue, but a reality and a need, when you cooked with what was in the pantry in a given time of the year. 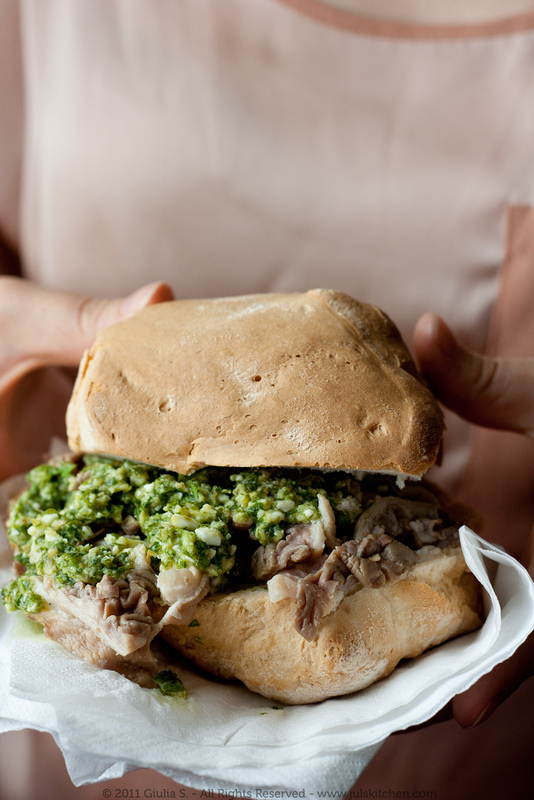 Among the many mouth-watering and typical recipes of the book – pigeon, carabaccia, necci, ribollita – I chose the one that is usually stamped with a family mark, bearing the flavours of a specific kitchen, the meatloaf: I wanted to savour that very special flavour of another family. It aroused shared memories, dragging me in a reality that I have not personally experienced, but of which I have heard so much about in my grandparents’ words or in my mum’s memories as a child. Preheat oven to 190°C. In a medium skillet, heat half of the olive oil over medium heat, and sauté the onion, carrot and celery for 5 to 6 minutes, or until the onion is golden brown. Set aside to cool. In a large bowl, combine the ground meats, sausage meat, eggs, breadcrumbs, 2 tablespoons of the parsley and the 2 teaspoons of salt. Add the sautéed vegetables and mix well. Shape it into an oblong loaf, compact well and gently dredge it in flour. In a Dutch oven or large ovenproof casserole, heat the remaining olive oil. Carefully transfer the meat roll to the pan and brown on all sides, turning gently, about 2 minutes on each side. Add the wine to the pan, stir to scrape up the browned bits from the bottom of the pan, and cook to reduce the liquid slightly. Add the stock, the potatoes, and the remaining 1 tablespoon parsley to the liquid in the pan. Cover and bake for 25 to 30 minutes. (I baked it for 50 minutes). Season the sauce with salt and pepper to taste. Let rest for 10 minutes before slicing. Cut into slice and serve with the sauce spooned over. Scrumptious looking! One of my favorite foods is peasant food. A book I have added to my list of coobooks to buy. 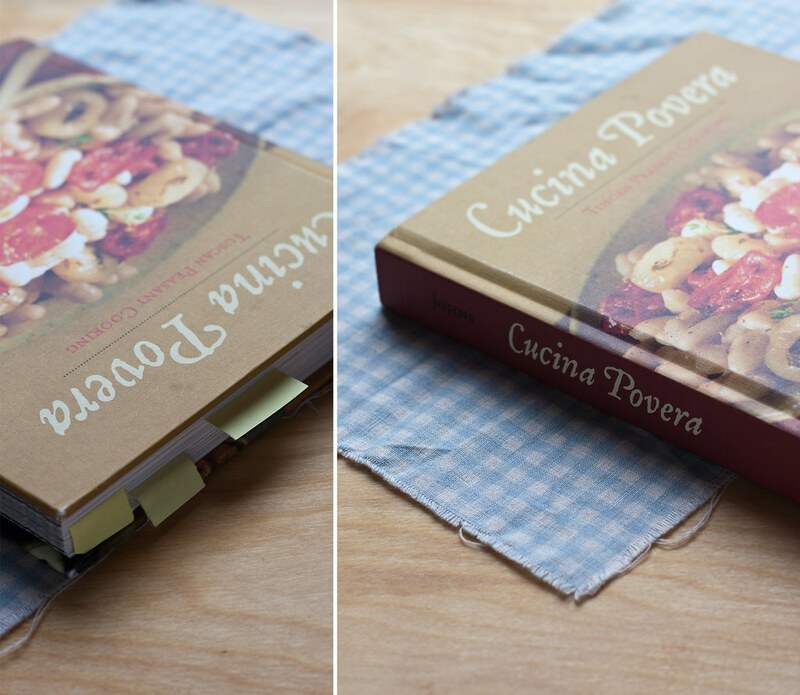 You know I love Italian food but Cucina povera is my favourite type! I really have to see if this book exists in English! The meatloaf looks delicious, your sister and parents are such lucky people, they eat like kings (or peasants) every day with you around! YEP! this book is in English, and I am sure you would adore it! I would love the cooked egg in the middle! This look absolutely amazing..very delicious looking photos and recipe is a keeper! Got to make this for my family!!! Have a great day!!! This looks fantastic! Kind of makes me want to be a peasant 🙂 Love the red wine in this, and the hint of bread crumbs. The texture looks perfect! I absolutely recommend you the book! Must check out this book. 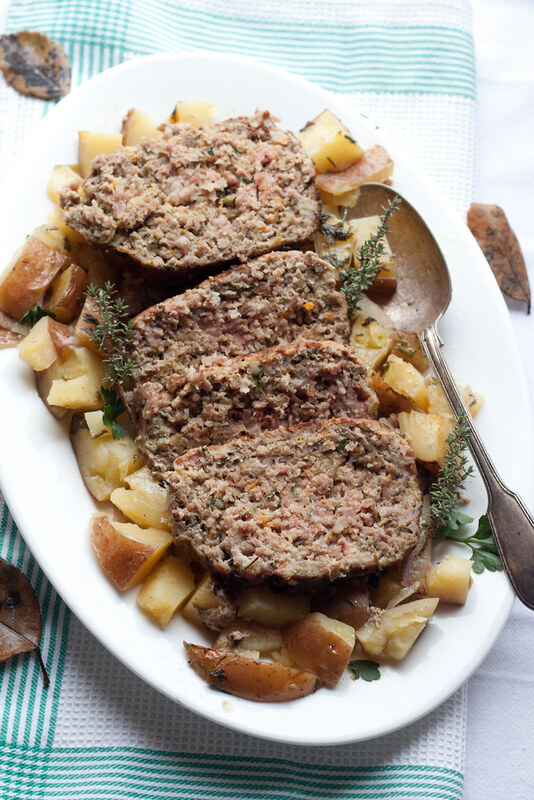 My family does not like meatloaf – have never been able to get my kids to eat it! This recipe looked so delicious that I decided to make it anyway. It was WONDERFUL! I didn’t change a thing about the recipe (except to convert it to US measures). It was flavorful and tender. The wine & stock made a wonderful gravy/sauce to pour over the top. My daughter (17 yrs old) was pleasantly surprised and had 2 helpings! Jul’s – you’ve done it again! that’s brilliant, Tracey!! 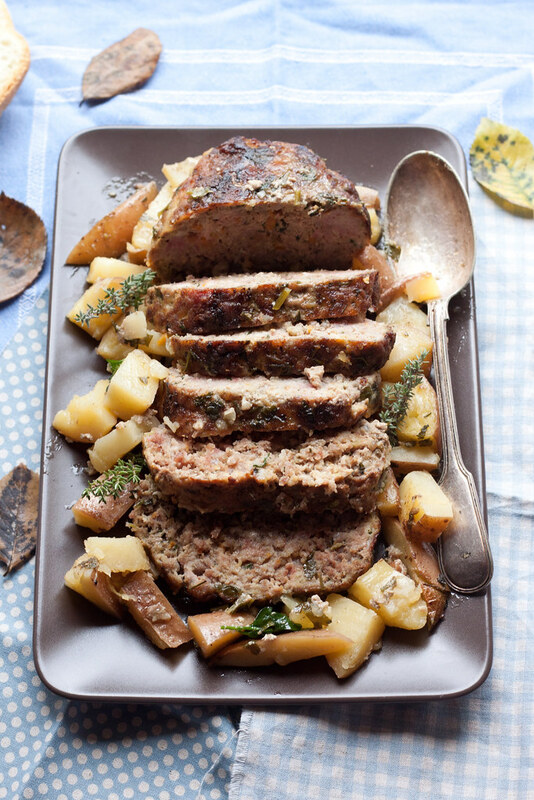 so happy you and your family enjoyed the the meatloaf, and I’m happy twice because you certainly used you magic touch to make it special for your dear ones! So now you have a new family recipe to enjoy!